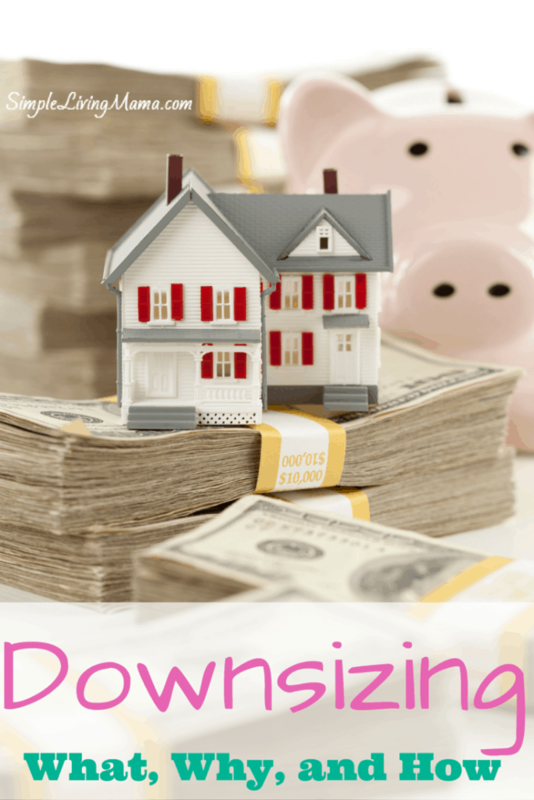 Downsizing – What, Why, and How? It all started with one little big problem. You see, I’m frugal. I always have been. Living simply comes natural to me because I was raised that way. I drive a 15 year old high mileage van with no car payment and it makes me happy NOT to have one. I think car payments are evil! Unfortunately, when it comes to this living frugal thing, everyone has a vice. For some, it may be shoes or clothes, some it may be the latest gadget, for me it’s stuff from the Dollar Tree (see I’m cheap), but for my husband it’s cars. So, how did a car lead to us downsizing from 2,600 square feet to 1,500 square feet? Let me explain. When my husband returned from his deployment in 2013, the only mode of transportation he had was a motorcycle. A motorcycle is only going to be a comfortable ride here a few months out of the year. If it’s raining, it’s going to be really uncomfortable. Before he left for his deployment, he was using my car the majority of the time and leaving me with no vehicle. Since we had moved even further from family, we decided the best decision was to get him a vehicle so we could be a two car family again. He was able to trade his motorcycle in for a used car. The total for the car was not too terribly much and the car payment was reasonable. I could live with it. Fast forward a few months later. The car started having some mechanical issues. At the time, my husband was driving over 100 miles a day to and from work. Instead of coming up with a solution to fix the car, he decided the best thing to do was to trade it in on something else. I’ve talked about setting financial goals with your spouse, but when it comes down to it, sometimes your goals are going to be very different. I was not on board with his decision. Let me tell you why. If you’re making payments on a car and it’s only been a few months, chances are you still owe more than the car is worth. Cars depreciate as soon as you sign the paperwork. You’re stuck unless you have enough cash on hand to pay the difference between what it’s worth and what you owe. We did not have enough to cover that difference. You can trade in an upside down car, but usually only on a brand new car with “rebates.” What happens to that balance that you still owe on your car after the dealer gives you even less than what your car is worth? It gets tacked onto your new loan, my friend! Let’s break that down into really simple terms. Your current car is worth $10,000, but you still owe $15,000. The final price of your new car is a whopping $30,000. Let’s say you’re lucky and the dealer gives you $10,000 for your old car. You drive off in your new car with a $35,000 loan on it. Instead of being immediately $5,000 upside down, you’re now $10,000 upside down. You either have to keep making payments for years on that new car before you can sell it again, or come up with a big chunk of cash to get out of it. That’s where we found ourselves. Hubs decided to take over the bill paying and I think that’s when he realized how much his new car payment was draining us. He actually came to me and said it was a mistake. That was huge. We started working together to come up with a plan to kick this car to the curb. I’ve known about Dave Ramsey for a while and tried to explain the snowball method to my husband. We were able to throw a small amount of extra money toward our debt, but we weren’t getting anywhere fast. After talking to a co-worker Hubs came home all on fire about Dave Ramsey. His friend had said, “Dude you gotta read The Total Money Makeover. It’s the best $10 I ever spent!” Doh! I had not actually read the book, so we bought it for me (it’s a bit more than $10 now) and hubs got the audiobook. After listening my husband kept saying, “We gotta blow the dam! We gotta get rid of this car in order to be able to build wealth.” We needed to find extra money to throw at this car to get it paid down. There’s two options: Cut expenses or increase income. We live pretty bare bones. Neither of us shop much except for groceries. We buy our kids’ clothes on consignment. The kids’ activities are minimal. We don’t have cable. The only place we could cut was eating out (which isn’t even weekly unless we are in a busy season) and movie rentals. Seriously. We started talking about increasing income. I make a small income from this blog and from freelancing, so I’m focusing on growing my business. I also homeschool and giving that up to work outside the home is not an option. Hubs is scheduled to the max with full-time work, the Reserves, and full-time school. The only other place we can cut is our house. I love where we live, but if leaving will help us in the long run I will do it. We rent and our lease is about to expire. 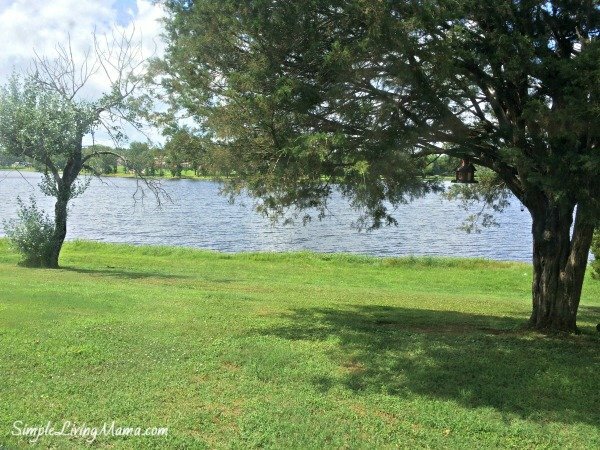 We started looking for a new home, but I found that even smaller homes were not much less expensive than our current rent unless we would live in a not so great area. With four young kids, I’m not compromising safety. So, I prayed for a solution. A few weeks later my husband found out we could rent a four bedroom house on base. The rent also covers utilities (not including phone or Internet). Still, it’s going to save us at least $500 a month. We just can’t turn that down. The house is smaller, but it has much more storage space than what we have now. 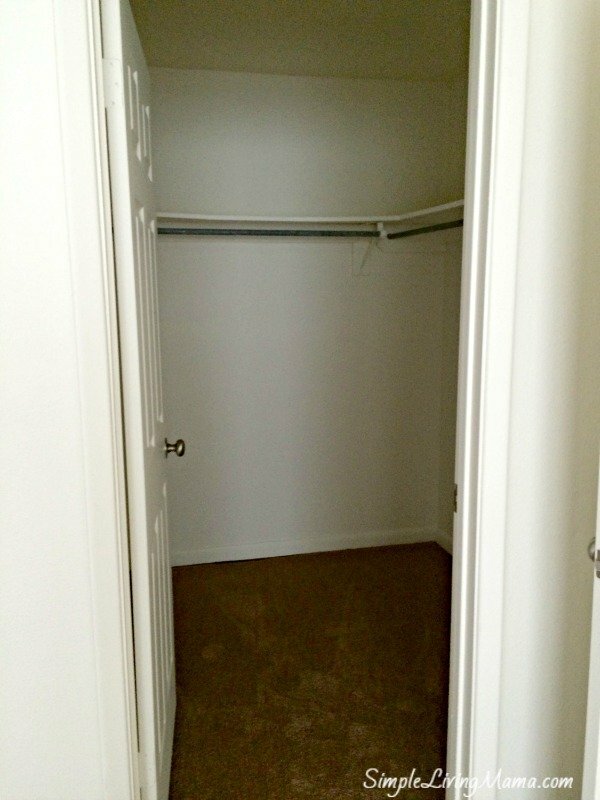 In our seven years of marriage we have never had a walk-in closet! Not that I’m going to fill it with clothes, but I think it will be easier to organize what things we do have. We also have a view of the base lake! Now begins the hard part of further decluttering, moving, and then getting settled and re-doing our budget to achieve financial freedom! We hope to get rid of Hubs’ car, get him a cash car, then work on purchasing a new-to-us van, and then we can buy our dream home and get back to having a big garden and backyard chickens. At least we can still have a container garden at our new house, and I hear there’s also a community garden. Have you downsized? How are you planning to achieve your financial goals? For us, we became debt free (paying off over $350,000 about a year ago. We are now saving while paying cash for our 2 kids to go to college. It’s been quite an adventure! Glad to find your site. Came over on the Mom2Mom Link. Joanie, SO glad to have found you on the Mom2MOm link up! We are also a homeschooling military family. (in the middle on another deployment! )Love Dave Ramsey and are busy teaching our kids about the good spending habits we did not learn until later in life! Good for you for following a plan. Base housing isn’t always great, but it is a great way to save money when you can. Praying God’s blessing on your life as you save and live life to the fullest! We just started the Total Money Makeover program. We are excited to be debt free eventually. I wish we could downsize. It would make it so much more comfortable for us. Rent is just as expensive here unless we lived in an apartment for awhile. We are also self-employed and that makes it very difficult to purchase a loan, especially right now. It makes us hesitant!! We keep praying though. And containing to budget and cut down expenses where we can. I hope your downsizing went well. Carrie, I wish you luck on your journey to be debt free! My husband spent several years self-employed, so I understand what you mean about the loans. Downsizing has been really good for us. I don’t miss the extra space, or the extra expense! We moved into a house that has us house poor. It’s definitely a killer to be stuck in a lease. This house drains us of 44% of our income (not including bills). I’m glad you were able to find something that saves you a few hundred dollars. Ouch on the car payment too! That’s super tough. I’m a Dave Ramsey follower too, never again will I lease a car. Can’t wait to have an extra $297 to our name. How are you liking the house on base? Hi Neyssa! We love our house on base. It’s been a really great move for us. Being house poor is no fun. We were so happy to get out of that high rent payment. Good luck on your debt free journey! Thanks for putting realism out there on financial goals. Hope you guys have reached your financial goals. We are in a similar situation, but the plausibility of downsizing is impractical. We have older children and the cost of living does not allow for any savings in downsizing. Also, military housing is privatized and is comparable to what we are already paying, but with less space and privacy. I am praying for a solution and common goals. I would definitely not downsize if it was impractical, and if you would be paying around the same with less space and privacy. I definitely hated the privacy issue. The military has moved us and we are in a large single family home now. We are closer to our goals, praise the Lord, but not there 100%. I ended up with a new van, so we have a car payment now after my other shut down while I was driving. Seems there’s always something when it comes to money and financial goals. Good luck to you!